Drake's IPA - AoM: Beer et al. After having between 1 and 2 cans of Bud from Slap Cup and Beer Ball, I began working on a Drake's IPA. Unfortunately, all I noted about the beer was a single word: bitterness. Drake’s original West Coast style India Pale is copper colored from additions of high quality Munich and crystal malts, which balance the stern bitterness and aggressive dank and citrusy hop flavors. Aromas of pine needles and grapefruit waft from the glass from the large dry hop additions of classic Yakima Valley hops Cascade, Chinook, and Centennial. The finish is clean and dry with a lingering hop bite. Drink Fresh. Available Year Round. In 1991, Drake’s put its first IPA into the tanks for the ever-growing number of craft beer fans yearning for hops. 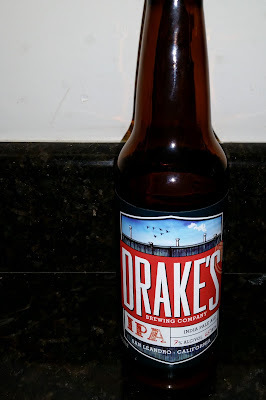 Originally more of an English-American hybrid IPA, over time Drake’s brewers kept the high quality specialty malts but moved toward a more West Coast approach. They ultimately created the balanced, dry IPA brimming with piney and citrus aromas from classic Yakima Valley “C” hops (think Cascade, Centennial, Chinook, Columbus) that continues to win over hop fans with every pint.